Once you have set a view window to display dynamic cross sections, it might not be obvious how to get it back to a normal view. Unlike the Plan and Profile windows, Cross Section windows don’t have an icon to access View Attributes in the view toolbox. To access the View Attributes dialog for a Cross Section window you can click the icon located on the left end of the window header bar. Or, if you are into keyboard shortcuts, Ctrl-B will also bring up the dialog. 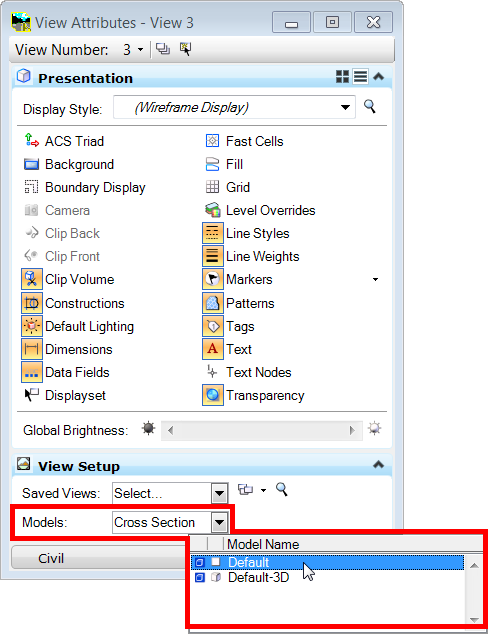 Once you have the View Attributes dialog displayed, locate the View Setup section and select one of the models available in the design file. This will return the window back to a normal view.